Part 1 Principles: Introducing microwave processing of food: Principles and technologies; Dielectric properties of foods; Measuring the dielectric properties of foods; Microwave heating and the dielectric properties of foods; Microwave processing, Nutritional and sensory quality. Part 2 Applications: Microwave technology for food processing: An overview; Baking using microwave processing; Drying using microwave processing; Blanching using microwave processing; Thawing and tempering using microwave processing; Packaging for microwave foods. Part 3 Measurement and process control: Measuring the heating performance of microwave ovens; Measuring temperature distributions during microwave processing; Improving microwave process control; Maximising uniform head distribution in microwave heating. With such advantages as more rapid heating and preservation of sensory and nutritional quality, microwave processing has proved a versatile technology. This important book reviews the wealth of recent research on how this technology affects particular foods and how it can be optimised for the food industry. Part one discusses current research on how microwaves interact with the dielectric properties of foods and reviews its effects on nutritional and sensory quality. Building on this foundation, the range of applications of microwave processing from baking and drying to blanching, thawing and tempering are reviewed. It also looks at packaging issues. The final part of the book covers the key area of process measurement and control to ensure more uniform heating of food products. 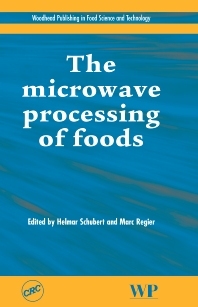 With its distinguished editors and international team of contributors, The microwave processing of foods is a standard reference for all those wishing to maximise the benefits of this important technology. Prof. Dr.-Ing. Marc Regier studied at the University of Karlsruhe physics before he received his doctorate at the Institute of Food Process Engineering (Prof. Dr.-Ing. Helmar Schubert) in the field of microwave drying of food and provision of water distribution by means of magnetic resonance imaging in 2003. In his time at the Federal Research Centre for Nutrition and Food (today Max Rubner Institute) he worked among others with the drying, microwave applications and other new methods. After another stay at the Institute of Food Process Engineering, he was in 2007 as Professor of Food Process Engineering at the Technische Fachhochschule Berlin (today Beuth University of Applied Sciences) called from where he moved to the University of Trier in 2010. As research priorities, Mr. Regier busy drying processes, microwave applications, and magnetic resonance imaging. In teaching, Mr. Regier represents mathematics, thermodynamics, fluid mechanics, thermal process engineering as well as new methods of food technology. Dr Kai Knoerzer has a background in process engineering (BSc), chemical engineering (MSc) and food process engineering (PhD), all awarded from the Karlsruhe Institute of Technology (Germany). In 2006 he commenced work with Food Science Australia as a Postdoctoral fellow; his current position in the Food and Nutrition Flagship is Senior Research Scientist. Kai has a proven track record in food process engineering research and development, particularly of innovative technologies. Currently, he is involved in research activities on engineering aspects (e.g., numerical modelling, simulation, process/equipment design and optimisation, as well as scale-up) across all innovative food processing technologies investigated at CSIRO, namely, high pressure (thermal), pulsed electric field, microwave, cool plasma and ultrasonics/megasonics processing. He is also leading the strategy development and project portfolio in the food stability area (Project cluster: Food Stability – Innovative Processing Solutions) and the extrusion platform project. Kai’s work has shown both science impact, with more than 70 peer-reviewed journal and conference proceedings and book chapters, two edited books (and two more currently being edited), over 120 oral and poster presentations at national and international conferences and 3 patents, as well as commercial impact in the food industry. His work has also been recognised with various international awards for research excellence.